Aside from love handles and heart disease, there's really only one discernable problem with pizza: you cannot instantly summon pizza wherever you are on this planet. Yes, it is categorically true that if you are somewhere indoors in the United States, you can probably finagle some type of pizza delivery to your location. After all, pizza delivery has (probably) existed in perpetuity since 19th-century Italy, and it's one of the most regularly ordered foods in the United States. But alas, occasionally the need for pizza arises in the great outdoors. Friends tend to gather at parks, beaches, street corners, national monuments, and other points of interest out in the wild. And pizza is by nature a communal food, meant to be shared with friends, frenemies, and good-natured strangers. Do you see the disconnect here? It's only natural to feel the pull of pizza in confines of nature. 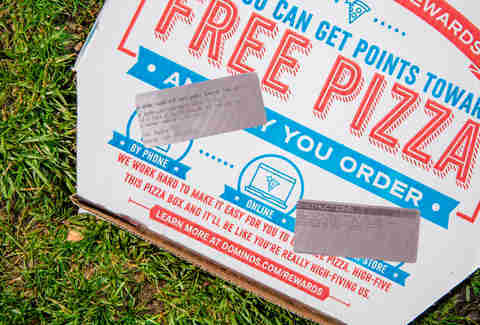 Domino's, being an eternal innovator of pizza technology (and a very wise judge on what "stunts" major food media outlets will cover) has taken this classic pie conundrum on, and introduced a new "Hotspot" feature that allows the pizza chain to deliver to locations without actual addresses, including parks, beaches, street corners, national monuments, and other points of interest out in the wild. So, in the vein of scientific exposition, we decided to be one of the first people in the country to put Domino's to the test. 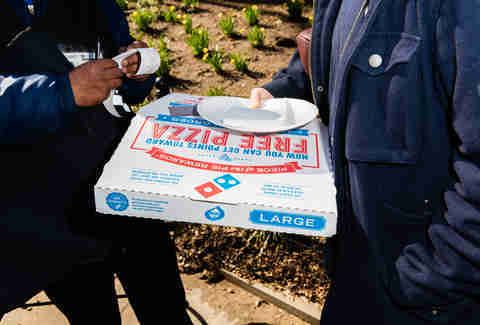 We grabbed a pigskin (to toss around in recreation) and headed to Manhattan's Washington Square Park to see how Domino's revolutionary new delivery service worked, in practice -- and to have a nice time outside because it turned out to be a beautiful day. The results shook me to the very marrow of my bones (in a good way). The real caveat with this new system is that you can't actually get delivery anywhere you want in the entire country. Their service is limited to pre-selected Hotspots that appear based on your location. As of right now, there are over 150,000 Hotspots in the United States. In New York City, there are basically multiple selection points in nearly every neighborhood -- with highly trafficked areas like Central Park and Midtown Manhattan having a Hotspots nearly every few blocks. Because there is no better place to eat pizza than on the sidewalk in Midtown Manhattan in rush hour. To access these predetermined spots, simply click the third option on the main selection screen on Domino's website (it is weird seeing another option aside from takeout and pick-up, honestly). From there, the site/app finds your location using your device's GPS -- with your permission of course (nice try FBI!) 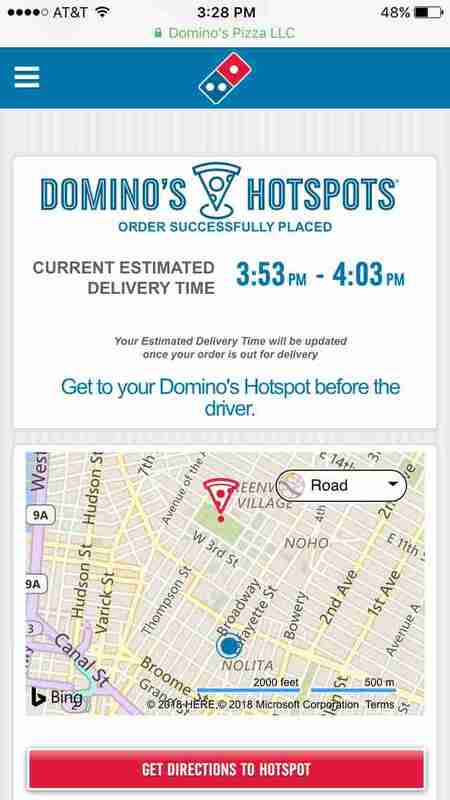 and displays the closest spots where you can meet a certified Domino's Delivery Person in your area. For us at Thrillist HQ, the closest (not to mention most scenic) option was Washington Square Park. When I ordered my pizza, there were no extra charges added for this new service, and the only real difference was that I had to describe my appearance to help the delivery person find me. I told them I had on a navy jacket on, brown hat, glasses, and that I was very, very good looking. I did not want to lie, after all. I paid. I was given a time estimate. And I walked to Washington Square Park to meet my man. It kind of felt like a drug deal. But a very well organized, delicious drug deal. I was already enjoying the experience. I arrived at the park, sat at its famous fountain, watched interpretive dancers practice their craft, and settled in to wait for the man. He came 10 minutes earlier than expected. I was a little flustered, but pleasantly surprised. The automated text told me he was at my location, but I didn't see him. After a very brief, highly windy phone call with some back and forth, we managed to spot each other (maybe I should have told him I was very, very, very good looking?). The exchange was no different than if I met the delivery person at my front door. I was also the first "hot spot" customer this particular driver had, and I was very happy to pop this cherry. The driver confirmed that this was an easy, seemingly simple way to deliver pizza, and he was pleased that this initial run went so smoothly. 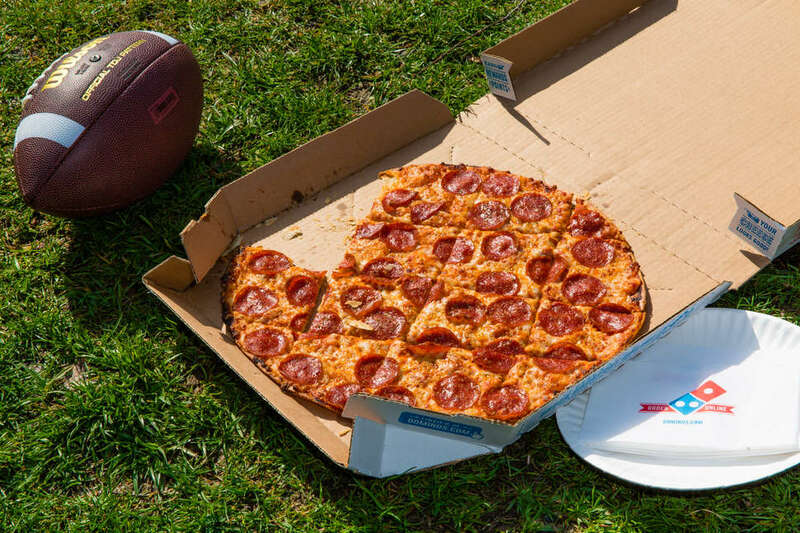 After that, I frolicked in the park for a little bit, tossing around the ol' pigskin, handing out pizza to strangers, and generally enjoying my newfound pie-based liberation. My delivery person was on time (actually, early). The pizza tasted the same. And the entire ordeal was surprisingly simple. Now, you might think living in NYC, where things are more "convenient" and even the rats eat pizza, I might be getting a different experience than say, Domino's fans in Norman, Oklahoma. But I dragged the Hotspot map over to Norman, Oklahoma, and found that wherever lies a Domino's, lies multiple options for a Hotspot. Overall, this is a noteworthy addition to the Domino's delivery empire. And something nearly every American can utilize. Any time you can get pizza in new places, it's a win for humankind. And may you never have to suffer through another day at the beach without a thin crust, pepperoni pie ever again. I only wish my grandparents were alive to see this.